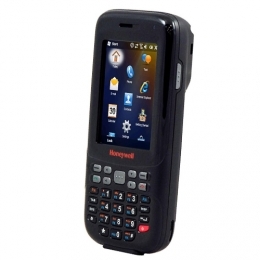 Honeywell DOLPHIN 6000 | Handheld Terminal | Esskay Technologys Pvt. Ltd.
Honeywell's Dolphin® 6000 Scanphone converges the functionality of multiple devices into a single, durable, and affordable pocket-sized device. Today's mobile workers require real-time communications and access to critical business data to make informed decisions at the point of customer service. Many of these information workers utilize multiple devices - such as smartphones, VoIP phones, two-way radios, laptop or tablet computers, GPS navigation systems, and Barcode scanners - throughout the day. This Dolphin scan phone provides the versatile data collection needed by today's workforce. 6000-HB-1 Dolphin 6000 HomeBase - US Kit. Single bay charging cradle with USB and serial (RS-232) ports for communications and auxiliary battery well for charging an extra battery. Includes US power cord and power supply. 6000-MC Dolphin 6000 Mobile Charge Cable kit. Includes 12V vehicle charging adapter and terminal cup.